Any little girl will love this unicorn design! Add it to bedding, clothing, head bands, almost anything! 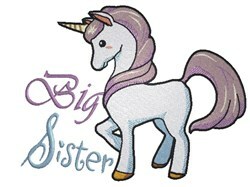 King Graphics is happy to present Unicorn Big sister machine embroidery design which has 20763 stitches and is [150.62 mm x 117.60 mm] large. If you would like to view more embroidery patterns please search on our embroidery designs page.